How to Reduce Office Supply Costs Using E-Signature Solutions? While running a business you strive to increase your income and reduce your costs. However, at this point you probably don’t think about reducing the fixed costs that seem to be an integral part of your spendings. Among them are rent, equipment, salaries, and office supplies. But what if we say that you spend too much on the latter? Just think for a moment, from month to month you spend money on enormous quantity of paper, ink, pens, staplers, and staples. But what for? Why don’t you try to reduce your office supply costs? 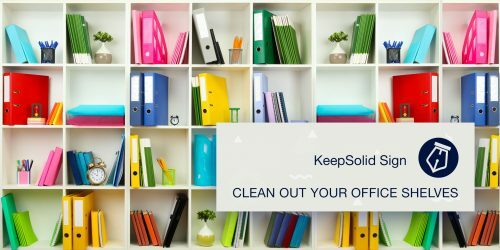 Inspired by AIIM’s paperless ideas and the Improving Business Operations article in particular, KeepSolid Sign team has decided to calculate how much money SMBs spend on the office supplies per employee each month. To top it off, we’d like to compare these results with paper free offices that use e-Signature software. You will really be surprised to hear these tidy sums. Check it out! What components does basic office supply budget include? It would seem logical to assume that big business owners spend a lot more on office supplies than SMBs do. However, if we calculate these costs per employee, there will probably be no difference. Let’s say, there are 300 contracts (2 pages each) that you need to sign per month. The old-fashioned print-sign-scan routine will take you 5 minutes per contract on average. These will include everything from preparation of a document to sending it to your partner. Paper. 300 contracts of 2 pages is 600 pages. The basic price for one sheet of paper is about $0,01. The final amount that you should pay for 600 pages is $6. Toner. With the basic price for a cartridge at about $76 and its duty cycle is about 2,600 pieces of paper, you’ll spend $17,5 per 600 pages. Administration fees. As we already said, you’ll spend about 5 minutes to prepare, sign, and send only one contract. This means that your employee needs 25 hours to sign 300 contracts. Let’s take the basic charge of this employee to be $12 per hour. As a result, this work will cost you$300. Shipping costs. If you have to send each contract to your partners to their offices within 1 country, you’ll also have to pay for mail delivery. The post offices in the US take about $0,55 per letter. $165 is the price for delivery of 300 contracts. How will KeepSolid Sign decrease your office supply costs? As a result, your total monthly spendings will be only $189,99 (at Personal subscription). It’s more than 2 times less than your basic office supply budget. So, why don’t you take a shot? Try KeepSolid Sign and decrease your office supply costs now!